Advocates for religious liberty welcomed the nomination of Judge Brett Kavanaugh to replace the retiring Justice Anthony Kennedy on the Supreme Court, saying that his record gives observers reason to believe that he is likely to be a defender of the Constitutional rights of people of faith in society. Within hours of President Donald Trump’s announcement of his high-court pick, and as what seems sure to be a contentious partisan showdown over his Senate confirmation was taking shape, a swirl of articles began drawing attention to a list of the Judge’s legal opinions on high-profile issues of the day, among them, a slim, but possibly telling, record on of the Judge’s views on religious liberty. Rabbi Abba Cohen, Executive Director of Federal Affairs for Agudath Israel of America, felt relatively confident that, should he be confirmed, Judge Kavanaugh would be a “positive force for religious liberty” on the bench. “There has been a trend over the last few years that the Supreme Court has come down on the side of religious practitioners when their beliefs came into conflict with government actions or the rights of other groups. He [Judge Kavanaugh] has shown himself to be a strong voice on the protection of religious rights and I would expect him to continue and to help the Court solidify that movement,” he said. Those parsing the Judge’s interpretations of the First Amendment guarantee of “free exercise” of religion have pointed to a 2015 dissent he penned in Health and Human Services (HHS) v. Priests for Life. In his opinion, he took issue with the court’s dismissal of the Catholic group’s claim that the Obama administration’s mandate that required them to finance certain medications conflicted with their beliefs. In it, Judge Kavanaugh said that the majority opinion had incorrectly applied the Religious Liberty Restoration Act (RFRA) as it had been interpreted in the Supreme Court’s 2014 Hobby Lobby decision. A concurring opinion that has also attracted attention rejected an attempt by an atheist group to remove the words “so help me G-d” from the presidential oath of office. In that case, Judge Kavanaugh traced a long record of jurisprudence that permits non-sectarian prayer at public government events. Nathan Diament, Executive Director for public policy for the Union of Orthodox Jewish Congregations of America (OU) said that he was still reviewing Judge Kavanaugh’s record, but pointed to a case he argued while in private practice on behalf of a Jewish congregation in Maryland that faced challenges by the local zoning board to its building plans. He said that his having taken the case revealed an interest in “an issue that affects our community more and more.” The case was one of several on religious liberties that he argued or for which he authored support briefs on a pro bono basis. He also served as chair of the religious liberties “practice group” of the Federalist Society, a conservative and libertarian legal organization. Several observers commented that Judge Kavanaugh’s role in the group revealed a broad interest in protecting the rights of people of faith. Howard Slugh, a Washington-based attorney who has authored support briefs presenting concerns of the Orthodox community on several key religious liberty cases in recent years, enthusiastically welcomed Judge Kavanaugh’s nomination. “I think we should be very confident that he will be a defender of religious liberty and that he will be even stronger on the Supreme Court. As a good judge, he was always very faithful to precedent from the high court, but now he’ll be much freer,” he told Hamodia. 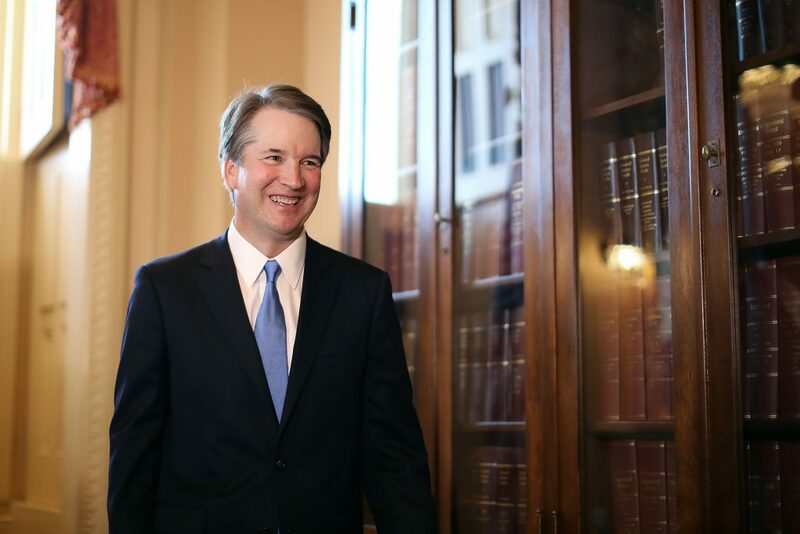 Soon after the announcement of Judge Kavanaugh’s nomination, The Jewish Coalition for Religious Liberty, for which Mr. Slugh serves as General Counsel, released a statement cheering his having been selected and expressing their hope that he would be confirmed before the Supreme Court begins its next term this coming October. For several decades, religious groups have closely followed cases affecting the constitutionality of government funding for sectarian organizations. Rabbi Cohen said that while he was not aware of any cases in which Judge Kavanaugh had an opportunity to rule on the matter, statements he had made praising the late Chief Justice William Rehnquist’s role in establishing precedents that put “religious institutions on equal footing with secular ones” were a likely indication that his opinions on the subject would be favorable to faith groups.